Including Saudi, the Q1 pipe production and sales were at 288,000 tonnes and 266,000 tonnes, higher by 26% and 22% Y-o-Y, respectively. The plate and coil mill production stood at about 123,000 tonnes. Sales was at around 128,000 tonnes in the current year. And of the sales mix, more than 70% was scattered to outside customers, keeping in line with the company’s efforts to reduce dependence on captive usage. A currency depreciation of 5% between 1st April and 30th June has benefitted the company in terms of the derivatives getting repriced, and that has gone into their other income. The average bid book to sales win ratio for the company stands at around 20-30%. The Forex derivatives impact amounted to INR 34 crores, included in other income. The other operating revenue comprises of sale of scrap, the VAT income, the export benefits. The company would try to maintain an EBITDA of around INR 8000 per tonne, for the India and U.S. business, taking a 4-quarter view. The company expects to execute its 1.6 million tonne of order book over the course of the current financial year and the next. Out of the total bid book of 3.1 million tonnes, the U.S. is almost 40%. Europe and MENA are about 30% and the balance, 30% is in India between oil and gas and water and the other segments. EBITDA reduced by about 19% Y-o-Y at INR 220 crores and the profit after tax, after minorities and share in associates and joint ventures, was at around INR 47 crores versus a net profit of around INR 55 crores in Q1FY18. EBITDA was distributed as under INR 50 crores in plate and coil mill business, and the balance from the pipe business. EBITDA for the pipe business in Q1 was around INR 7,700 a metric tonne, slightly less, higher Q-on-Q, but down. The company has maintained an improved cash conversion cycle at around 30 days versus 34 days quarter-on-quarter. Gross debt as of 30th of June 2018 went up by about INR 47 crores quarter-on-quarter and was at the level of about INR 1,433 crores. On a Y-o-Y basis, gross debt has been reduced by INR 598 crores. This was made possible due to the continuous efforts towards realigning the debt book to match the requirement of the business and also repayment and prepayment of debt wherever feasible. The company looks to continue pursuing that agenda. Net debt was higher by about INR 54 crores quarter-on-quarter and was at the level of INR 476 crores as at 30th of June this year. On a Y-o-Y basis, net debt has been reduced by about INR 388 crores. Including the Saudi operations, the net debt was INR 1,025 crores, which was lower by about INR 271 crores compared to last year's same figure. The company remains committed towards conserving cash and continues to aim for a leaner balance sheet. Cash flow generated is to be used largely for debt repayment, except for required essential CapEx for the business. The company has booked more than 212,000 tonnes of pipe orders since their previous call, and this is reflected in the strong order book, which is at a level of about 1,602,000 metric tonnes (after executing 267,000 tonnes in the current quarter) and valued at over INR 11,000 crores. The figure was at around 1,657,000 metric tonnes in the previous quarter. The bid book stands at over 3 million tonnes and the potential upcoming projects, which are expected to come up in the next couple of years and are spread across major Welspun markets, stand at a strong figure at over 15 million tonnes. In the domestic India market, demand is gaining pace across most segments. The demand outlook for the plate and coil mills division continues to be promising, but the company needs to address profitability concerns. The company expects a ramped-up production across markets in Q2 and Q3. The company has made an EBITDA of INR 50 crores from the plate and coil mill, and it aims to achieve its previous year level of INR 170 crores. A major increase in expenses has been caused by an increased freight and material handling and transportation-related expenses, which have gone up compared to previous period because of the sales mix in current quarter being based on destination, which means duty paid and delivery at destination. The company believes if they are able to manage the steel in the supply chain well within time to the respective units, they can achieve a plant utilization factor of in excess of 85%. With increasing emphasis on local sourcing requirements across all the key geographies including the U.S., India and the Middle East, players with local capacity are expected to gain. And Welspun Corp with sizable capacities in India, U.S. and Saudi Arabia is believed to be ideally poised to benefit from this policy change. The company has seen a demand uptick in the US market, with a growing order pipeline. In the MENA region, oil and gas segment demand is expected to become more relevant in the second half of current financial year. 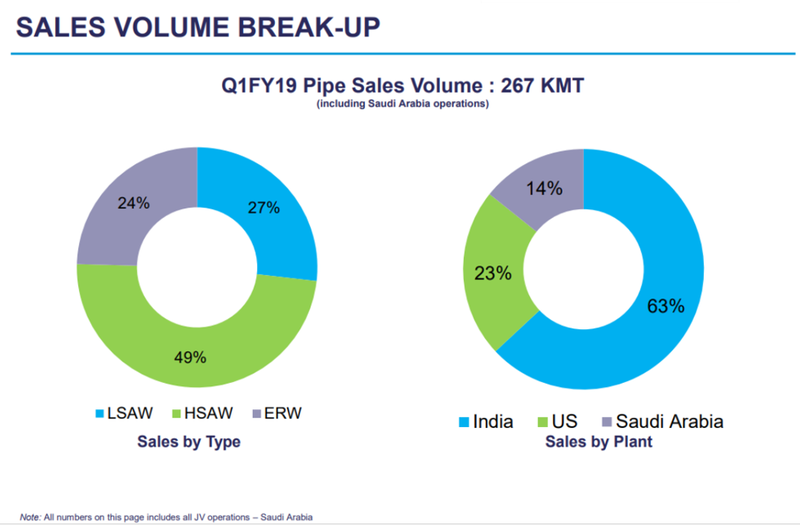 Q1 was a challenging quarter for their Saudi business, with a volume of about 35 KT and a reported loss of INR 27 crore, but the benefits of a strong order book would be evident from Q2 onwards. The company has seen low capacity utilization of its Saudi mills, which have a production capacity of 300,000-350,000 tonnes. But a strengthened order book shows promise of a total production of around 275,000-300,000 tonnes, and a higher throughput would result in improved bottom lines. The old order books have been liquidated for the most part, except for a few large orders left to execute, which are mostly in the water segment in Saudi. Total volume form Saudi operations in the previous financial year was 96,000 tonnes. The U.S. volumes in Q1 were of the magnitude of about 60,000-65,000 tonnes. Some regulatory changes (such as duties on large dia pipes) have turned US into a market more relevant for local players. But for a few long seam capacities and long seam projects where US companies will have no option other than buying from outside the country, Welspun would be one of the preferred vendors for them. And they also have an annual capacity of 0.5 million tonnes between 2 mills in U.S. The company has seen quite a few projects that have come up for bidding, and out of the 3 million tonnes that in their bid book, a large portion is in the U.S. which they expect it to be awarded over the next couple of months. In the U.S., the business booked by the company is all based on local sourcing of coil and with back-to-back cover, hence there is no exposure to coil prices. Historically, U.S. business has been more profitable than India business, but that depends largely on the quality of orders. The competition has remained the same, with a slightly better order books, which might help in improving margins. In India, taking water and oil and gas as 2 major segments, there are 3-4 players who are there in that market in water segment, which include Jindals and Ratnamani. In the oil and gas space also, several players exist. But not many of them will have the track record or the capacity to cater to the market. 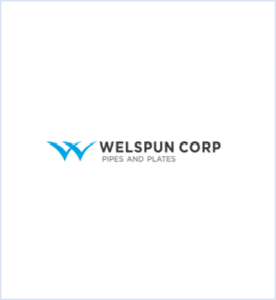 In oil and gas where there is concrete-based coating required, only 2 companies have that capability at this point in time, including Welspun. In U.S. markets, there are 2 or 3 big players- major competitors being Staub, Vog. But Welspun is the largest player in that market, and enjoy a market share of around 25%. The company is setting up a spiral plant in Madhya Pradesh, capacity around 175,000 tonnes, basically to align their production capacity closer to the market with an expected CapEx of around INR 175 crores. The spiral plant being set-up in Madhya Pradesh expected to be installed and commissioned in around 6-months, and would start to give benefits in the following financial year. The company has announced a capex of INR 175 crores in MP, and they see a sizeable opportunity in MP, Rajasthan and Western UP in the coming years, hence maintaining presence in these states. The spiral plant in MP would focus on the water segment at this point of time, but it also has the ability to handle the non-water space. They will also be enabling themselves to do API business as and when it is available. The company expects a payback period of roughly 5 years from the plant.